Problem Bacteraemia in dialysis units accounts for major morbidity, mortality, and antibiotic usage. Risk is much greater when lines rather than fistulas are used for haemodialysis. Surveillance is critical for infection control, but no standardised surveillance scheme exists in the United Kingdom. Design Prospective study in a London dialysis unit of the implementation and applicability of a dialysis associated bacteraemia surveillance scheme developed in the United States and its effect on bacteraemia, antibiotic usage, and admission. Setting Hammersmith Hospital dialysis unit, London, where 112 outpatients receive dialysis three times weekly. Between June 2002 and December 2004, 3418 patient months of data were collected. Key measures for improvement Successful adoption of the scheme and reductions in bacteraemia rates, antibiotic usage, and admission to hospital. Strategy for improvement Embedding the surveillance scheme in the unit's clinical activity. Effects of change Raised awareness of bacteraemia prevention, prudent antibiotic prescribing, and the need for improved provision of vascular access. The scheme required two hours a month of consultant time. Significant downward trends were seen in bacteraemia rates and antibiotic usage: mean rate ratios from quarter to quarter 0.90 (95% confidence interval 0.85 to 0.94) and 0.91 (0.87 to 0.96), respectively. The rate of admission to hospital also showed a significant downward trend, with admissions directly connected to access related infection declining more rapidly: mean rate ratio of successive quarters 0.90 (0.84 to 0.96). The overall proportion of patients dialysed through catheters was significantly higher than in US outpatient centres (62.3% v 29.4%, P < 0.01). Study data were successfully used in a business case to improve access provision. Lessons learnt Dialysis specific surveillance of bacteraemia is critical to infection control in dialysis units and improving quality of care. Such a scheme could be adopted across the United Kingdom. Although major morbidity and mortality are associated with dialysis related bacteraemia, no standardised national surveillance scheme exists in the United Kingdom.1 Surveillance is the key to infection control and prevention, risk management, and quality improvement. A major risk factor for bacteraemia is the mode of vascular access for haemodialysis. Appropriate access must be established before haemodialysis can start. Haemodialysis catheters are easy to place into central veins, providing immediate circulatory access. Both non-cuffed temporary catheters and cuffed long term tunnelled catheters are used (fig 1). For patients who require long term haemodialysis the optimal choice is the formation of a native arteriovenous fistula (fig 2); when this is not surgically possible, a prosthetic graft can be created. Those patients requiring haemodialysis before an arteriovenous fistula or graft can be established (they take several weeks to mature) can be dialysed through either type of catheter. However, catheters remain widely used as the long term mode of vascular access in patients requiring long term haemodialysis. In addition to the risk of bacteraemia associated with mode of access and patient risk factors, other important risks need to be considered. These include standards of line care, infection control practice, water quality,15 staff training, and staffing levels.16 Surveillance data on bacteraemia in dialysis units would reflect all these factors and target action. Surveillance is a critical component of infection control yet no specific scheme, with appropriate denominator data and risk stratification, for dialysis associated bacteraemia exists in the United Kingdom.1 In 2004 the UK National Audit Office report on nosocomial infection stated that surveillance was patchy. The report identified renal units as an area that particularly required surveillance schemes.1 Dialysis units were not previously covered in the nosocomial infection national surveillance scheme run by the Public Health Laboratory Service, as only inpatients were included. Furthermore, participation in the surveillance scheme was largely managed by infection control teams and not embedded in the clinical services. The national mandatory methicillin resistant Staphylococcus aureus bacteraemia surveillance17 is inadequate for patients receiving dialysis because of the lack of appropriate denominator data and the breadth of isolates causing bacteraemia. Neither the UK Renal Association Standards and Audits Group15 nor the UK Renal National Service Framework18 recommends schemes or targets for dialysis associated bacteraemia. In 1999 the US Centers for Disease Control and Prevention in Atlanta established the Dialysis Surveillance Network, a voluntary system to monitor bloodstream and vascular infections across outpatient dialysis units in the United States. Data from different units can be appropriately compared as it takes into account access provision. The network is now well established.2 By the end of our study period the network had 325 378 patient months of data from the participating units. Our key improvement measure was the embedding of a dialysis specific bacteraemia surveillance scheme in the local unit's activities. We used compliance with surveillance and capture of data as a measure of success in the implementation of this scheme. Reductions in bacteraemia rates, admissions to hospital, and antibiotic usage were measures of the scheme's effect. Collaboration was established with the Centers for Disease Control in April 2002 to pilot the Dialysis Surveillance Network scheme in London. We aimed to assess the bacteraemia rate in our unit and improve quality of care, to study the local effect of the surveillance programme, and to assess if the scheme could be adopted by a busy London centre and have applicability for dialysis units in the United Kingdom. In total 31 months of surveillance took place, equivalent to 3418 patient months of data. Data included a total of 523 incidents (404 admissions to hospital and 239 prescriptions of intravenous antibiotics initiated) and 172 episodes of access related bacteraemia. After the initial set up of surveillance, the scheme required two hours a month of a consultant's time. The dialysis unit staff considered that continuous rather than intermittent surveillance was more efficient, and embedded the scheme in the day to day activities of the unit. This fostered local ownership and clinical engagement. Compliance was maintained throughout the study period. Surveillance raised awareness and provided a cornerstone for improved infection control and line care involving all staff of the dialysis unit. The data feedback generated unit led programmes of risk reduction and infection control. The surveillance data were also a powerful business tool to negotiate improved resources for access provision. 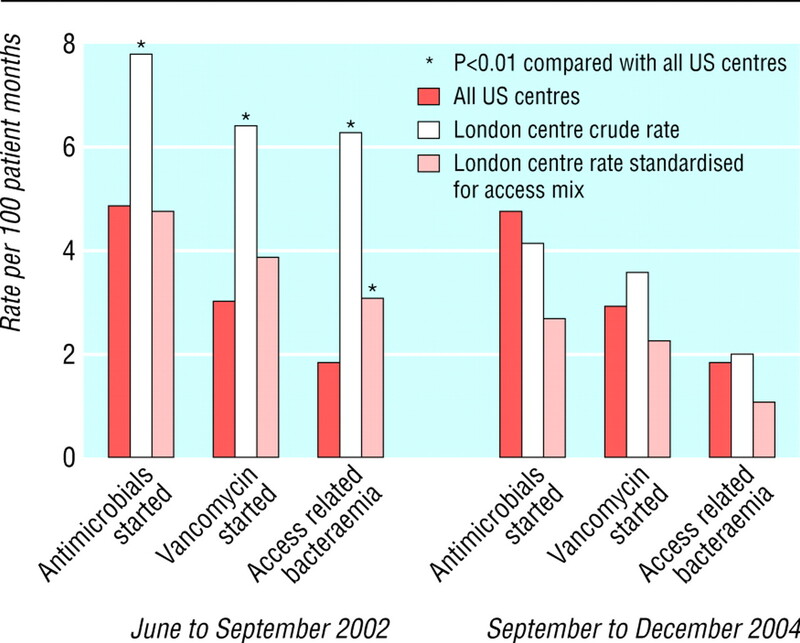 The crude rate for access related bacteraemia between June and September 2002 was 6.2 per 100 patient months. We had a significantly higher usage of catheters than the participating units in the United States (74% v 29.3%, P < 0.001). The bacteraemia rate fell to 3.2 when the bacteraemia rate was standardised for access mix (fig 3). This was still significantly higher (P < 0.01) than the overall US rate of 1.8, indicating that infection control activity around line insertion and line care could be improved. Fuelled by these data, from November 2003 we started an extensive unit based programme of risk reduction, infection prevention and control, education and awareness, and improvement of access provision. With weekly multidisciplinary meetings on infection in September and December 2004 the crude rate was 2.0 per 100 patient months (1.1 per 100 patient months when standardised for access). This represents a significant overall downward trend; the average ratios of rates in successive quarters in this 31 month period were 0.90 (95% confidence interval 0.85 to 0.94, P < 0.001; table). 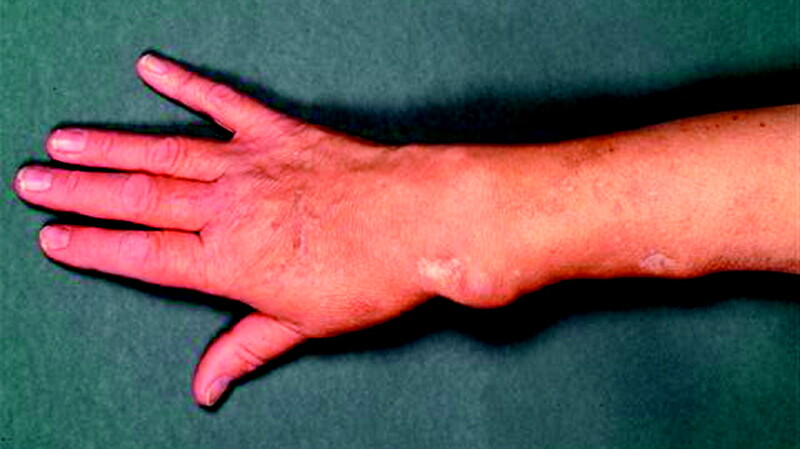 A similar trend in the incidence of starting intravenous antibiotics was found (rates fell from 7.7 per 100 patient months during June to September 2002 to 4.10 during September to December 2004; fig 3). Clinical criteria for starting antibiotics remained unchanged throughout the surveillance period. The average ratio of rates in successive quarters was 0.91 (95% confidence interval 0.87 to 0.95). The rate of starting intravenous vancomycin decreased from 6.4 during June to September 2002 to 3.6 during September to December 2004 (average ratio of successive quarters 0.91, 0.87 to 0.96, P < 0.001; table). The unit used a significantly higher proportion of catheters (74%) than the participating US centres (29.3%, P < 0.001). With the data from the surveillance scheme, a successful business case was made to increase access provision. The rate of formation of arteriovenous fistulas in the unit rose to 45% in December 2003. By the end of the study period, however, it fell back to 30% owing to changes in case mix and high throughput of new patients for dialysis. Despite this, the significant downward trend in bacteraemia and antibiotic usage was maintained, indicating sustained improved line care and infection control. In the first quarter the overall rate of admission to hospital was 15 per 100 patient months. By the last quarter of the study (October to December 2004) it had fallen to 12.3, representing a significant overall downward trend: average ratio of successive quarters 0.95, 0.92 to 0.99; P = 0.006). Admissions for access related infection declined more rapidly: average ratio of successive quarters 0.90, 0.84 to 0.96; P = 0.001), falling from 4.00 per 100 patient months at the beginning to 1.4 at the end (table). We showed that a dialysis specific surveillance scheme could be easily and successfully embedded in a busy London dialysis unit. Local knowledge and ownership of data at a unit level are critical to generating change and quality improvement. After implementation of the scheme, awareness of infection control and optimising vascular access increased and rates of bacteraemia and antimicrobial usage fell significantly. The effect on antibiotic prescribing has particular public health importance, as intense antibiotic usage in dialysis units has contributed to the global emergence of antibiotic resistance.19 20 Although the scheme had much local benefit, it was limited in facilitating useful external benchmarking. Comparison of data from an in-centre dialysis unit at a tertiary care NHS hospital with data from US outpatient dialysis units is unsatisfactory, as there are potentially many differences in care provision, practice, staffing, and case mix. However, we propose that this scheme has general applicability for UK dialysis units and should be adopted as a nationwide dialysis associated bacteraemia surveillance programme. This would tackle this important healthcare associated infection at a national level in the growing population of patients requiring dialysis in the United Kingdom. The opportunity also arises to add to the dataset to obtain further information on risk factors, practice, antibiotic usage, and antibiotic resistance. Implementation of such a surveillance scheme for bacteraemia should be part of quality care and risk management activity for all dialysis units. This would allow useful comparisons across the United Kingdom, facilitate local monitoring and targeted action, and provide the background for practice evaluation and research. We thank the Hammersmith dialysis unit staff, particularly Marion Garrett, Mila Dionara, Li Wang Shirley, and Vernisha Ali; Mike Richards, statistician, Infection Prevention and Control Service, Hammersmith Hospitals NHS Trust; and Merid Gebru and the medical illustration department at the Royal Free Hospital, London, for the photographs. Contributors AHH started and coordinated the project and is guarantor. AG, overseen by AJC and CP, led the implementation on the unit. AG, EJC, and KBB were responsible for data collection and local feedback. JIT provided the analysis. AHH, AG, and EJC wrote the manuscript. All authors contributed to the final draft. Ethical approval The data management and surveillance had Caldicott Guardian approval.
. Improving patient care by reducing the risk of hospital acquired infection. London: UK National Audit Office, 2004; 14 Jul.
. New national surveillance system for hemodialysis-associated infections: initial results. Am J Infect Control 2002; 30: 288–95.
. Prospective surveillance for primary bloodstream infections occurring in Canadian hemodialysis units. Infect Control Hosp Epidemiol 2002; 23: 716–20.
. Vascular access use in Europe and United States: results from DOPPS. Kidney Int 2002; 61: 305–16.
. Mortality and hospitalization in haemodialysis patients in five European countries: results from the dialysis outcomes and practice patterns study (DOPPS). Nephrol Dial Transplant 2004; 19: 108–20.
. Prospective evaluation of a Dacron cuffed hemodialysis catheter for prolonged use. Am J Kidney Dis 1988; 11: 166–9.
. Type of vascular access and mortality in US hemodialysis patients. Kidney Int 2001; 60: 1443–51.
. A comparison of deaths between patients treated with haemodialysis and peritoneal dialysis. J Am Soc Nephrol 1995; 6: 184–91.
. Canadian hemodialysis morbidity study. Am J Kid Dis 1992; 19: 214–34. Economic costs of end-stage renal disease. In: USRDS2003 Annual data report: atlas of end-stage renal disease in the United States. Bethesda, MD: National Institutes of Health, National Institute of Diabetes and Digestive and Kidney Diseases US Renal Data System, 2003: 161–72.
. KDOQI clinical practice guidelines for vascular access, 2000. www.kidney.org/professionals/kdoqi/guidelines_updates/doqi_uptoc.html (accessed 27 Mar 2006).
. Population need for renal replacement therapy in Thames regions: ethnic dimension. BMJ 1994; 309: 1111–4.
. Organ donation in the UK: a survey by a British Transplantation Society working party. Nephrol Dial Transplant 1997; 12: 2251–7.
. Impact of a large non-indigenous population on the renal transplant waiting list. Transplantation Proceedings 1997; 29: 3724.
. Treatment of adults and children with renal failure: standards and audit measures, 3rd ed. London: Royal College of Physicians of London and Renal Association, 2002.
. Nursing resources: a major determinant of nosocomial infection? Curr Opin Infect Dis 2004; 17: 329–33.
. Improving surveillance of MRSA bacteraemia. BMJ 2005; 331: 976–7. Staphylococcus aureus resistant to vancomycin—United States, 2002. Morb Mortal Wkly Rep 2002; 51: 565–7.
. High-level vancomycin-resistant enterococci causing hospital infections. Epidemiol Infect 1989; 103: 173–81.